This was as predictable as the change of the tides. In the special mayoral election just held, Ocean Beach voted for Councilmember David Alvarez and Point Loma voted for Councilmember Kevin Faulconer – who won. UPDATE: We have a new map, t hanks to http://inewsource.org. Much better than the black and white maps provided by the U-T San Diego on the break-down of the vote. In the new map, the blues are precincts where the majority of the votes went to Alvarez. And the red is where they voted majority for Faulconer. It’s somewhat confusing, as the red gray area includes the National Cemetery and the Cabrillo Light House park. Frank – check out the interactive maps from inewsource.org. Type in “92107,” and you can also compare the Primary and the General special elections – there were some changes in our zip code. Gretchen – thanks and I did and then reposted it and linked to the site. Those of us who were Alvarez voters should (re)learn a lesson by using the “voter turnout” bar in the link provided by Gretchen and Frank. 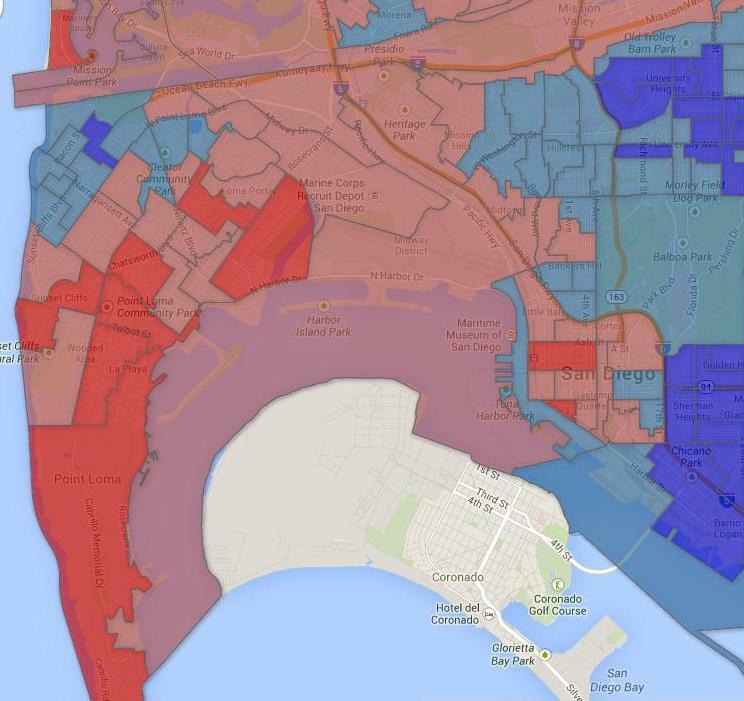 Highest voter turnout – it’s the red parts of the city that voted for Faulconer. Lowest voter turnouts – yep, the blue areas for Alvarez. We can’t complain if people don’t get off their butts and vote. This is PRECISELY the reason Republicans across the country are working so hard to put restrictions on voting! No one is keeping anyone from voting, unless you think you have a right to get a check cashed with no ID, buy beer, or even use a credit card without your picture on it, with no ID. It’s pretty suspicious there is such an uproar over verifying who you are to vote.